A unique event showcasing sound-art and music in the historic setting of York Minster. 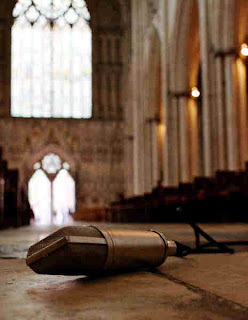 I Hear Too: Live will feature seven specially commissioned music, performance and sound-art installation in various locations around the Minster. The varied programme of works will, over the course of the evening, explore, interpret and re-examine the space, architecture and daily life of the Minster, making use of various aspects and features of the building. We encourage the audience to sit, walk or interact with the works as appropriate - this is not intended to be a traditional concert experience! An audio-visual piece inspired by the ways in which York Minster, over many centuries, has been both the focus and transmission point for the key ideas and meanings that bind our culture. The piece will use the sound of the Minster bell(s) to initiate a series of audio-visual sequences commenting upon chains of cause and effect and the spread of influence and ideas in faith, culture and time. 12,000 years ago the geographic position of the Minster would have been underneath a giant glacier - and potentially within the next thousand years, the next 'Ice Age' will start. These two pieces fill the Nave with the sounds recorded from inside Antarctic glacier: in 'Cravasse', giant Icicle bells are used as source material, and in 'Melt Water the inter-moraine smelt water rivers are explored. A cacophony of found sounds in the Quire aisles leads you via footstep tracks to the Zouche Chapel. In the Zouche Chapel a subdued sound montage interweaving the stories of those who look after the Minster building providing a place of contemplation where the audience can be immersed in story telling snippets woven in to a sound poem about how the Minster is looked after from the waking up of the building to its closing at night. Octo: Sotto Voce is an 8-channel sound installation presenting an audio montage of whispered voices. The whispered prayer, the respectful tone or the irreverent aside are characteristic of the voice hushed to convey private conversations not intended for widespread dissemination. The piece will be installed in the Chapter House to make use of its exceptional acoustic properties and stunning architecture where 8 loudspeakers will be face out from the central octagonal floor motif. I Hear Too Live starts at 8pm on 7 October. Tickets - priced £10 (£5 conc) - are available now from York Minster Box Office, Church House, Ogleforth, York, YO1 7JN. How can audio and acoustics research be employed in the interpretation, understanding and representation of heritage materials and artifacts? How might such audio materials be better preserved for future generations of researchers and heritage visitors? Our event scheduled for 23rd September, Arup/DDS, Glasgow - "Virtual and Augmented Acoustic Auralisation" has been POSTPONED - this will now take place on Wednesday 25th November 2009.